Crown Mark 5271 is the 2017 release upholstered panel bed with a brand new modern design and a robust construction. It is offered in four different sizes of twin, full, queen and king and three different upholstery colors of black, gray and stone. It scores 4.1 out of 5 by 60 customers which indicates good amount of customer satisfaction with a more than reasonable score. You’ll get the full bed with the rails, footboard and headboard. It will fit in any decor nicely thanks to its neutral faux leather upholstery and the clean and simple design. Black color will be especially easy to match to other furniture and appliances in your house. Crown Mark Upholstered Panel Bed is a sturdy and durable unit that is made of wood and plywood. You’ll get all the parts you need for assembly inside the rear headboard and the simple tools like an Allan key and is very easy to put together, like in ten minutes or so with the pieces labeled clearly. You can use it with an existing box spring in your house. The headboard is nicely padded and will offer you more comfort. The king size weighs 72.6 pounds and measures 86.6 x 80.1 x 50 inches. The queen size weighs 62.5 pounds with the dimensions of 86.6 x 64.4 x 50 inches. The full size is 53 pounds and 81.5 x 58.1 x 50 inches and the twin size is 48.8 pounds and measures 81.5 x 43.1 x 50 inches. It is not only easy to put together but also can be disassembled- you can separate the frame from the headboard. There are no pilot holes pre-drilled for you to screw the slats down but it is not hard to do. 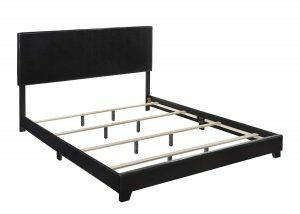 Both the box spring and the mattress will sit on the frame and you’ll probably want a high box spring in there as the frame itself is not high. If you have a thick mattress you won’t need a box spring, but otherwise you probably will, especially with a foam mattress. It would also be nice to have three more slats as four does not seem to be enough in some cases. Please note that you will not get the mattress in photos included in the box. You’ll get it shipped to your address well packaged and swiftly via Amazon.com. Judging by some of the customer reviews it offers very good value for money. It is a very sturdy and comfortable bed with a modern yet simplistic design, at an affordable price. And after purchasing this unit you will deal with a great customer support team that is willing to help with your queries or problems. For example if there is a damage during transport they’ll replace the broken piece straight away. You will sleep comfortably as there will be no squeaking when you shake the bed.